The track is virtually underneath the Severn Bridge and is on playing fields to the side of the public road that leads down to the Old Ferry Boat Inn. Although the fields are outside the secure area of Beachley Barracks they are owned by the MoD and the signs indicate that they are not open to the public. 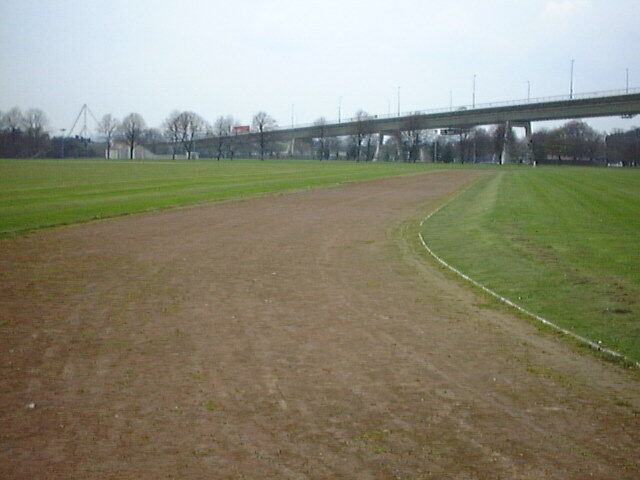 The track itself is in fairly poor condition and is a bit overgrown. There is a scoreboard down the back straight. The Barracks were formerly the Army Apprentices College and think they are now used by the Royal Welsh Fusiliers and the Cheshire Regiment. The postal location of the track is in Wales but the administrative location is in England.